ROBOTC.net forums - View topic - New to robotics and looking for a starting platform! I am excited to register and new to this forum, and have some questions that maybe someone can lead or give me some advise. I am new to robotics, and would like to start a on a life venture on learning everything that I possibly can - of course with a salvageable resource. I do have a 25 years of experience as an rc enthusiast working with this off-the-shelf technology such as sensor gyros, servos, rx's, etc. Up until here, with the tx programming and calibration I have knowledge but outside of this into robotics - I am lost. Finally, I am looking to find a product platform that would allow be to perhaps build a perhaps a walking robot or spider. I am looking for product that also has other add-on capabilities, such as adding a wireless camera, adding a motion sensor, etc. The idea is that I want to have a unit that I can build on and not hit a brick wall too soon. If anyone has any suggestions, please send them my way and I would greatly appreciated! Re: New to robotics and looking for a starting platform! The arduino platform is definitely a great place to start. There's lots of documentation, and lots of ready-made hardware as well. All of the things that you mentioned sound very possible with this platform. There's a big support community out there (and now the ROBOTC community has joined in as well), so you'll have lots of help if you do "hit a brick wall". Finally, I am looking to find a product platform that would allow be to perhaps build a perhaps a walking robot or spider. Here is a youtube video of a walking arduino. There are many more out there. Thank you for the response! I was looking into getting a Arduino but would need to figure which one to get. I am really interested in starting of with one of these hexapods spiders. But would need to find a suitable one, like the uBUG hexapod. I was looking into getting a Arduino but would need to figure which one to get. I am really interested in starting of with one of these hexapods spiders. But would need to find a suitable one, like the uBUG hexapod. In choosing an Arduino board it depends on HOW you hook up the servos. You can hook them up directly or indirectly. First I'll talk about directly hooking them up to the Arduino. A direct hook up means connecting to the Arduino's digital pins. 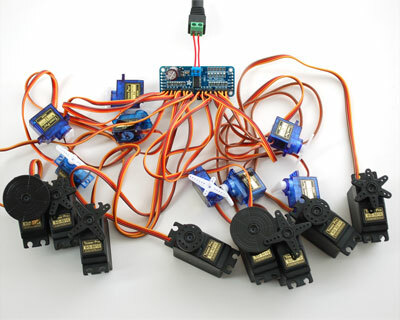 The Uno supports up to 12 servos and the Mega supports 48 (see Arduino Servo library http://www.arduino.cc/en/Reference/Servo). The Hexapod needs 12 for the Silver one or 13 (I think) for the orange one with the jaw. IF you are going to DIRECTLY drive that many servos you really should use two separate power sources. One source of power for the Arduino (like a 9v battery) and another source for your Servos (say... 6 AA batteries). Also I highly recommend de-coupling in your setup. That many servos is bound to cause erratic behaviour and it will just save you from a debugging nightmare. See http://www.thebox.myzen.co.uk/Tutorial/De-coupling.html for a good explanation and tutorial on this. There are other solutions such as an SD20 chip or SD21 Servo driver board (see http://www.robot-electronics.co.uk/htm/arduino_examples.htm#SD20%20Servo%20Controller ) The SD20 needs a clock (its basically a PIC16F872 chip) the SD21 I believe has all the components. The only issue I see with using a Servo driver is that the ones I have looked at connects via the I2C bus. I am not sure how much bus contention there would be for driving that many servos AND if you have any I2C sensors. That was very informative and very nice of you to lay it out so extensively. Thank you! This really helps alot and I'm hoping that I could return to you for some more questions and guidance. Thank you again! Gosh! I am excited and looking forward to post my projects at some point. I'm excited to see what you come up with, there's nothing quite like taking that first plunge into the world of microprocessors. As you go you'll start to get more and more ideas, and what starts out as a simple project usually gets cooler and more complex as you learn more about the microprocessors and what they can handle. As others have stated, the Arduino is a great starting platform because it's powerful, flexible, and yet not too complicated. Other options later on are Parallax's Basic STAMP (slightly different coding used, instead of C based programming it uses BASIC based programming), the PIC/PICAXE (these are actual 8-40 pin chips that you can design circuits around, a lot more flexible but more work is involved with using them), ARM processors...the list goes on. 1) Research everything. It's likely that someone has already attempted or completed what you want to do (which isn't always a bad thing) and you can see what they did, how they did it, what problems ran into, how they overcame those problems, etc. It doesn't mean you have to follow them step by step, but it always gives you a good starting point. 3) Document everything. It's important to document your code, schematics, ideas, parts lists, etc when first starting out, but it becomes harder and harder to do the more you get into it. I know, you get caught up in the moment and want to keep moving forward, but make sure to document changes! This way if a change makes the robot worse you can easily roll back to a working version AND it's simply good to have documentation on your projects. It shows others, too, the work involved, the thought process involved, and can help others who want to attempt a similar project. Some of the biggest regrets I have from my college days are projects that I spent a lot of time on and learned a lot from, but didn't document anything on (and they later got torn apart for parts). Last edited by JohnWatson on Wed Jun 20, 2012 2:30 pm, edited 1 time in total. Just another 2 cents to add in reference to what John Watson said. I tend use a program called Fritzing for documenting builds (for Arduinos anyway). It's open source (free) and it is pretty easy for a beginner to use. For example here is a pic of the interface you might like of multiple servo hookups. Another program I use is called Eagle CAD which has both a free and paid version. It is a little more professional than Fritzing but for general documentation I find Fritzing easier. There is one downside to the Arduino that I forgot to mention; there is a small (can't remember exact measurements) gap between the two rows of header sockets on the digital pin side. Although it doesn't seem like much, it makes creating custom boards a nightmare. If it wasn't for that gap, you could just solder some header pins onto a perboard and be good to go (the analog side's gap is 1 pin wide, so it's not an issue). I really, really wish that gap wasn't there; if I remember correctly, it was a design flaw in the original Arduino boards and they don't want to change it and ruin the backwards compatibility with all their shields, which is a legitimate concern. So, be forewarned that if you plan on making your own shields for the Arduino boards, you should be prepared to get a little bit creative with its design and hookup method. Or, if you're feeling bold, you can make your own Arduino (I plan on doing this soon, on a board without the annoying header gaps ). (I plan on doing this soon, on a board without the annoying header gaps ). I'm not much of a hardware guy but I've made basic ones using the 328P chips. It is 'easy' so long as you use an FTDI friend for the programming (its FT232RL based like the one on the old Duemilanove). Curious if you plan to use any shields with yours? The gap is only slightly wider but mounting a shield on might be tricky. Thank you for all the feed back guys! I am starting to browse for some of these components at some of these locations. I just feel like a kid again but with a certain adult mission and creativity - if you know what mean! LOL! Thank you again for the support! Coincidentally, could an arduino servo ports be used to say, aluminate and control a series of connected lights in the these ports as-well? The reason I ask is that at some point, I would like to salvage the arduino board to be used in this fashion or configuration - to basically create an interactive light display. Thanks again guys for your feedback!!! Love it! I don't think any of the existing shields designed for Arduino would work because of that small gap, so it's a double-edged sword. I'll be able to make my own shields cheap and easy, but won't be able to use any of the existing shields as drop-ins. I'm going to make a thread about it once I get it all sorted out (schematic wise, it actually looks fairly simple) and I'll post all the nitty-gritty details up on there. I just feel like a kid again but with a certain adult mission and creativity - if you know what mean! Welcome to the fun world or robotics! That feeling never really goes away The hard part now is trying to decide what exactly you want to build, especially considering the nearly limitless amount of options out there as far as parts and functionality. Keep us posted, I can't wait to see what you come up with! Maybe you could use two rows of headers? One with the normal 1/10" (or whatever it is) gap, and another with the weird Arduino gap?